The general public in England and throughout Europe was fascinated with the First Fleet adventure; to sail around the world and establish a convict settlement at Botany Bay. 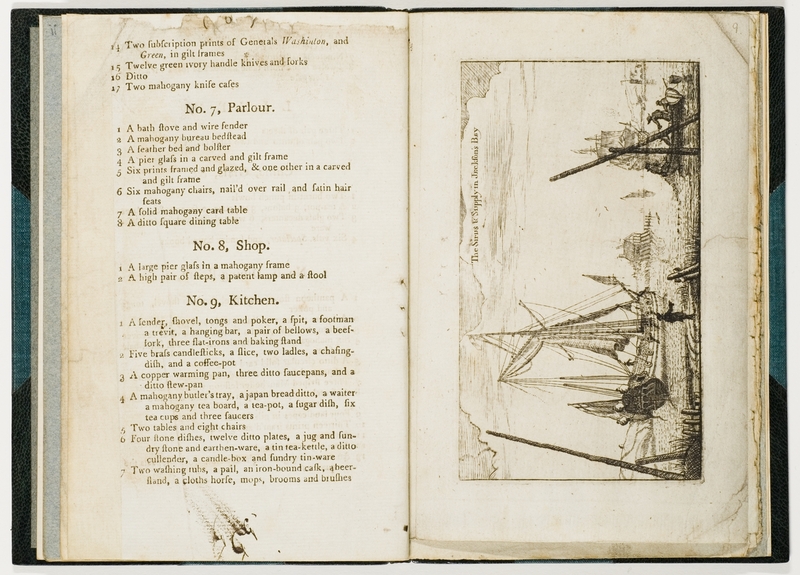 Enterprising publishers made arrangements with a number of potential First Fleet authors before they left England. The first published accounts came on to the market in 1789. The transport ships of the First Fleet left Sydney in July 1788, gradually returning to England in 1789. The crews brought with them sketches and letters from friends and colleagues staying in the colony as well as official documents and the first rough manuscripts of these potential best sellers. Among the most important and frequently reprinted accounts published by officers of the First Fleet are Watkin Tench's A Narrative of the Expedition to Botany Bay..., 1789, Governor Phillip’s The voyage of Governor Phillip to Botany Bay : with an account of the establishment of the colonies of Port Jackson & Norfolk Island… published in 1789, the illustrated journal of surgeon John White, published in 1790, John Hunter’s official journal published in 1793 and Judge Advocate David Collins' detailed account published in 1798, An account of the English colony in New South Wales. The Library holds an unrivalled collection of early published accounts. Many of these editions are extremely rare. The earliest printed account of the new settlement is a one page broadside held by the Mitchell Library. Extract of a journal from England to Botany Bay was written by Richard Williams, a common seaman on the Borrowdale. This unique document is undated but was probably published in London around March or April 1789. 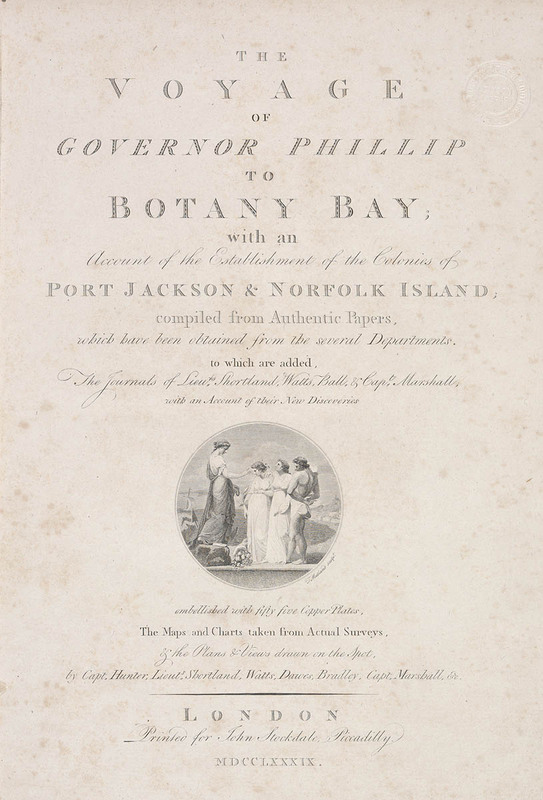 A narrative of the expedition to Botany Bay : with an account of New South Wales, its productions, inhabitants, &c. : to which is subjoined a list of the civil and military establishments at Port Jackson / by Watkin Tench. 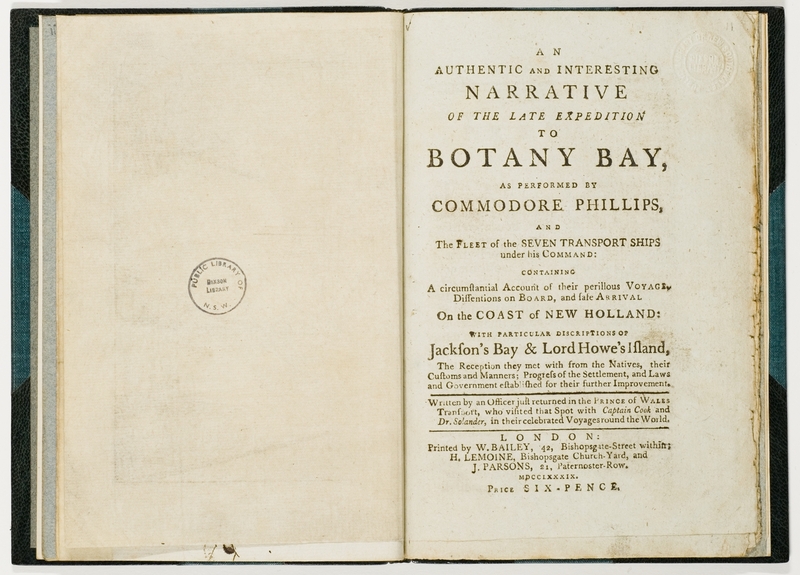 An authentic and interesting narrative of the late expedition to Botany Bay : as performed by Commodore Phillips and the fleet of seven transport ships ... containing an ... account of their ... voyage ... and safe arrival ... with ... descriptions of Jackson's Bay & Lord Howe's Island, written by an Officer...was published in April 1789. Very little is known about this rare publication, possibly the earliest account of the settlement. The text was taken from a series of articles published in the London Chronicle newspaper. The articles were based on 'interviews' from various crew members from the Prince of Wales, the Borrowdale and the Alexander, transport ships returning to England from Sydney Cove at intervals throughout 1789. 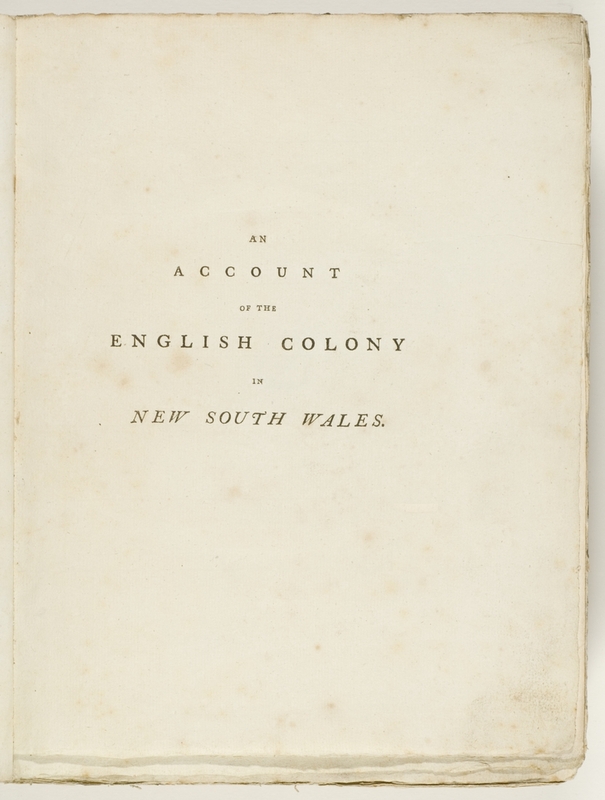 Added to this series of articles was An Historical Narrative of the Discovery of New Holland and New South Wales which was published much earlier in 1786. The authorship of this compilation of new and old material was attributed to “an Officer”. The volume below is a rare edition of the above publication, published later in 1789. It contains a badly edited version of the first section of the earlier publication and includes an engraving of the Sirius and the Supply in Port Jackson. This slim volume of which only two copies are known to exist, was donated to the Library in 1952 from the personal collection of Sir William Dixson. It is bound with a catalogue of household effects and a poem entitled: The caterpillar and butterfly : an allegory. 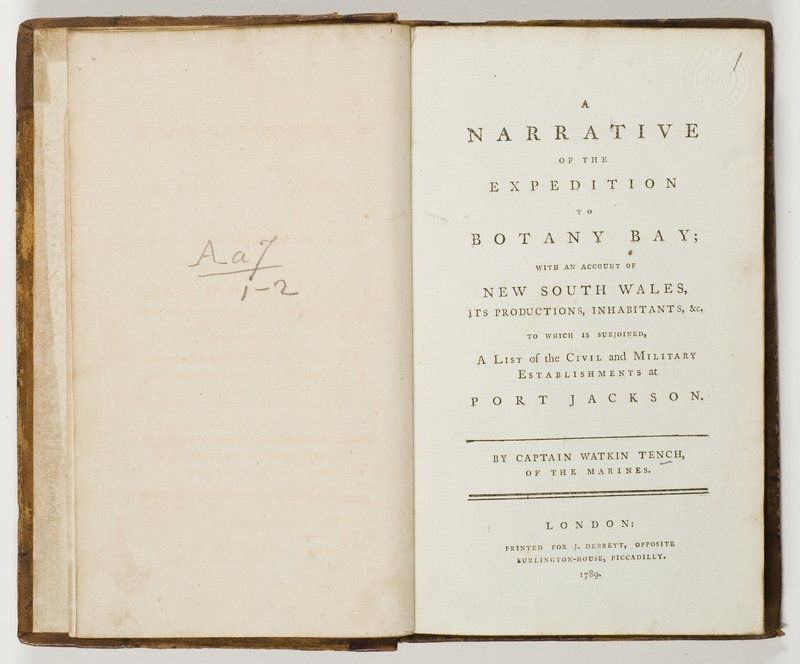 A narrative of the expedition to Botany Bay: with an account of New South Wales, its productions, inhabitants, &c. : to which is subjoined a list of the civil and military establishments at Port Jackson by Watkin Tench ( 1758 – 1833) was one of the earliest published accounts of the First Fleet voyage and the early settlement of Australia. 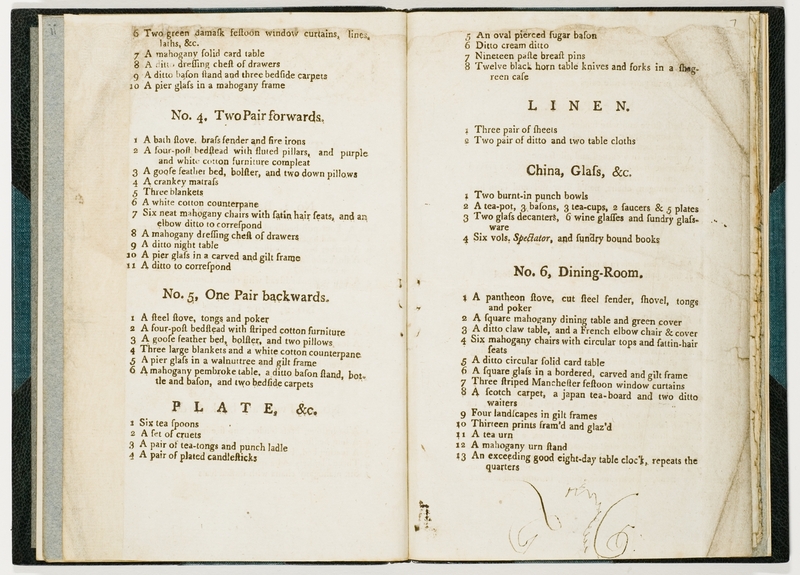 Before leaving England, Tench made arrangements with Debrett’s of London to record his journey and first impressions of the colony for publication. Tench’s manuscript was taken back to London by John Shortland who sailed for England on the Alexander in July 1788. The first edition appeared in London in 1789. 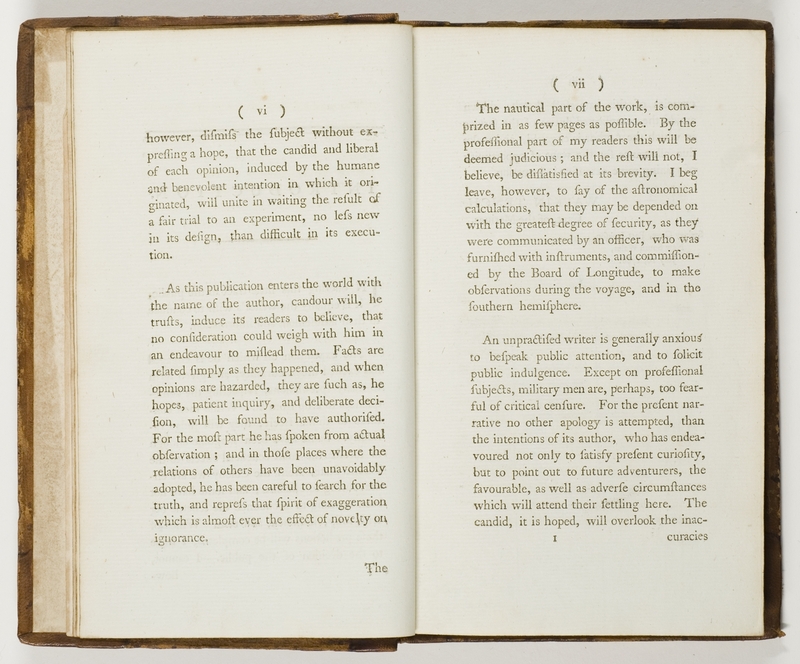 The narrative was immensely popular and several edition were published in 1789 and later years including editions in French, German, Dutch and Swedish. In 1793 Tench completed A Complete Account of the Settlement at Port Jackson. Watkin Tench was a Captain–Lieutenant of the Marine Corps and sailed with the First Fleet on the Charlotte in May 1787.Tench’s narrative is engaging and easy to read. He provides entertaining accounts of the daily activities in the colony and intelligent, often sympathetic, observations of important events, convict life and the nature and status of the Indigenous peoples. This copy of Tench’s Narrative was donated to the library in 1952 from the personal collection of Sir William Dixson. It is a bound in a contemporary calf binding with another volume, An Estimate of the temperature of Different Latitude, by Richard Kirwan, 1787.